NeuCo is the leading provider of optimization software solutions that help electric power producers reduce emissions and improve efficiency and availability. NeuCo’s solutions reduce NOx and GHG emissions, improve fuel efficiency, reduce SCR operating costs, and streamline the detection, diagnosis and remediation of plant reliability, capacity and efficiency problems. As a leading combination electricity and natural gas energy company, Xcel Energy offers a comprehensive portfolio of energy-related products and services to 3.4 million electricity customers and 1.9 million natural gas customers. They have regulated operations in 8 Western and Midwestern states. Xcel's Tolk station is an 1,100 MW coal-fired plant located in Muleshoe Texas. It is in a CAIR state and an area that has been expanding its renewable energy (wind) footprint. Hear David Head, Controls Technician at Xcel’s Tolk Station, discuss how using NeuCo's Boiler Optimization systems (Combustion and Sootblowing) have helped the plant improve temperatures, sprays and boiler efficiency; reduce NOx emissions in response to CAIR while adhering to CO limits; and adjust to changing dispatch profiles due to wind power. 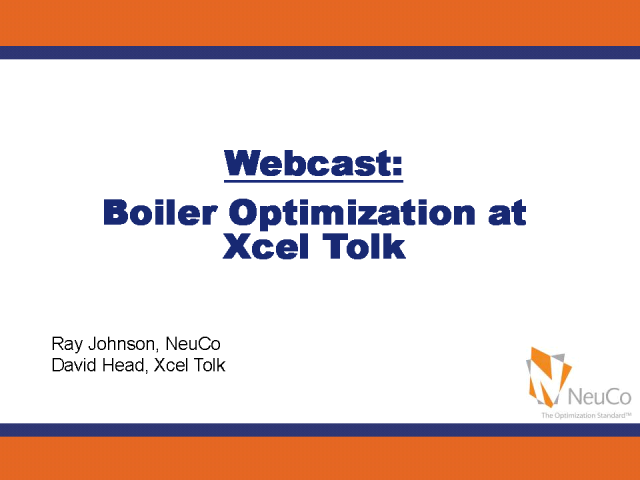 This webcast will be recorded in front of a live audience at the upcoming NeuCo Plant Optimization Tour, to be held at the Tolk Generating Station in Muleshoe, TX on October 7th and 8th, 2009.